I remember sitting in a briefing with Samsung last year when the company first started talking about translating its success in the Android smartphone space into the tablet market. 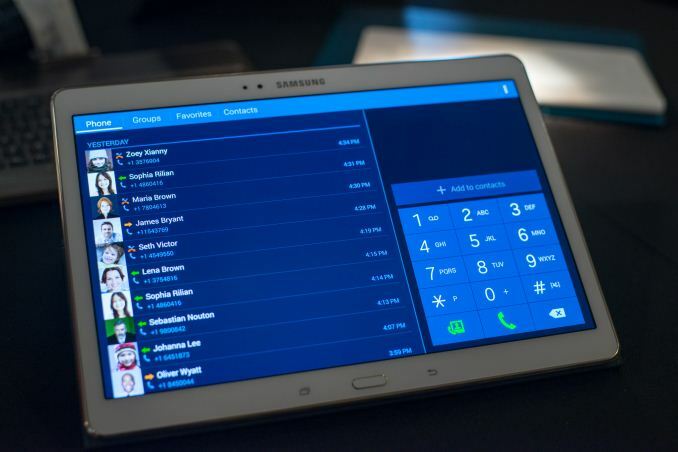 Samsung has done well in the Android tablet space but it’s safe to say that the company is better known for its phones. This year Samsung hopes to change all of that and is putting its most valued mobile sub-brand (or letter) to work in tablets. Later this month (globally) and starting next month in the US, Samsung will begin selling its Galaxy Tab S line of premium tablets. From the very beginning you can tell things are different with the Tab S. The Galaxy Tab S will be available in two different sizes, both with a 16:10 aspect ratio: 10.5” and 8.4”. Each size comes in two different colors: dazzling white and titanium bronze. 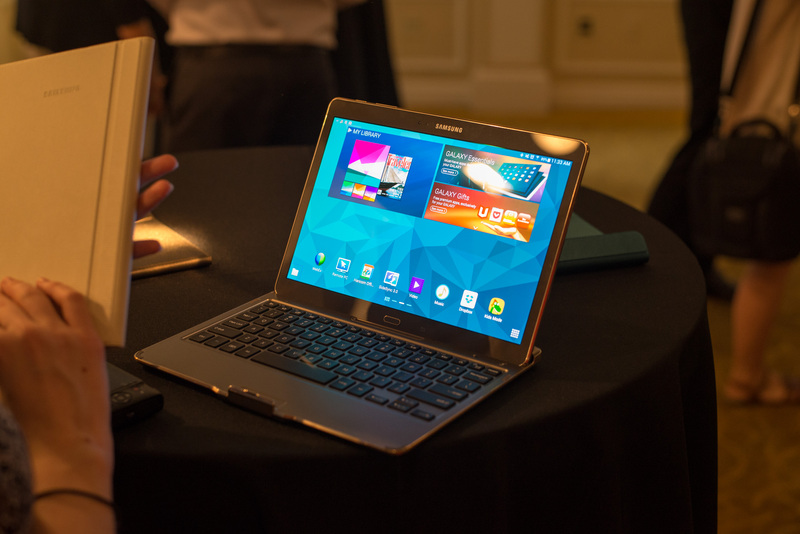 The Galaxy Tab S models are styled quite similarly to the Galaxy S5. The front of the device features a dedicated home button (with integrated fingerprint sensor), flanked by recent apps and back buttons. The back of the device is covered in a non-hyperglaze polycarbonate with a textured pattern that looks similar to the back of the GS5. The actual back surface feels a bit smoother than what you get on the GS5. 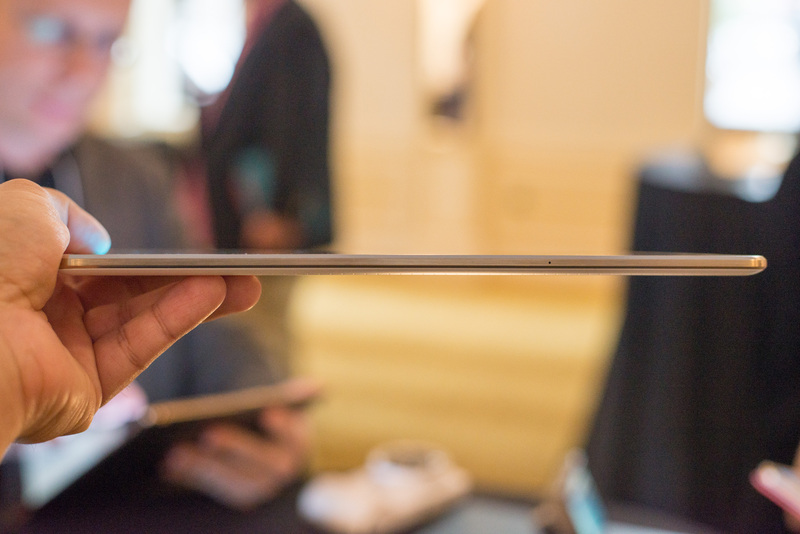 At 6.6mm thick, both models of the Galaxy Tab S are thinner than the iPad Air, iPhone 5s and Galaxy S5. Samsung is able to leverage the extremely low profile afforded by its Super AMOLED display to help drive chassis thickness to incredibly low levels. I noticed absolutely no fatigue in holding either device in a single hand. 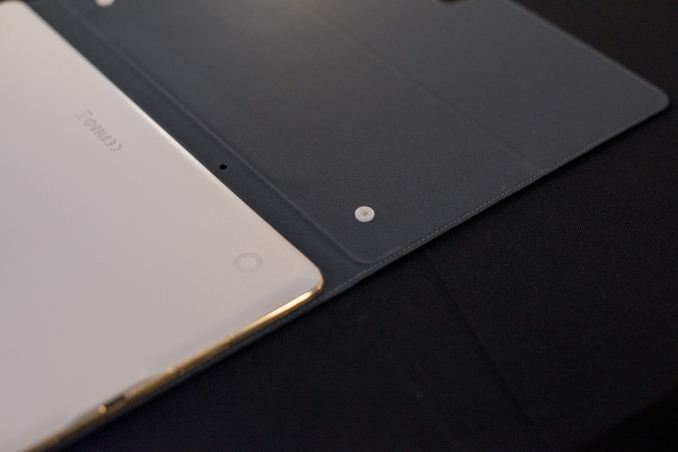 I think we’re finally nearing the ideal thickness and weight for content consumption tablets. Both Galaxy Tab S models feature a 2560 x 1600 Super AMOLED display. According to Samsung, the 10.5” model features a full RGB stripe, while the 8.4” Tab S has a diamond PenTile subpixel structure. I always forget to bring my macro lens to these things but both panels appeared to use a weird subpixel structure to my unaided eye. I'll confirm when I get my hands on a review device. 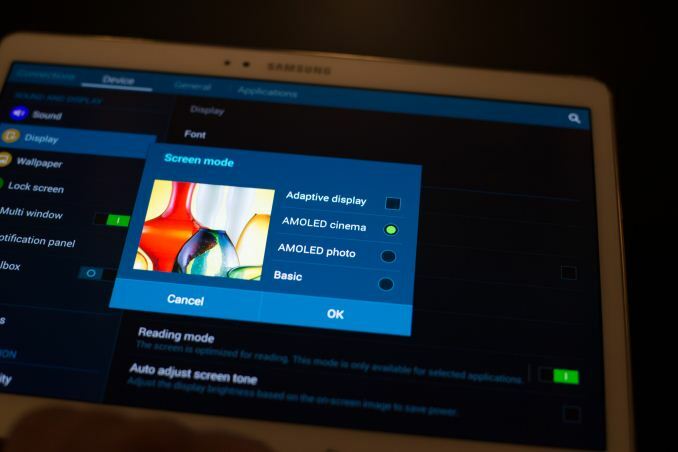 Both tablets feature Samsung’s new Adaptive Display mode that adjusts the tint of the display based on the color of ambient light, but the usual predefined color modes should be present as well. On the global demo units I played with there were four operating modes (including adaptive display), although these tend to get renamed when we eventually get them on US models. I’m hoping Samsung’s color accuracy tuning on the GS5 made its way to the Tab S as well. 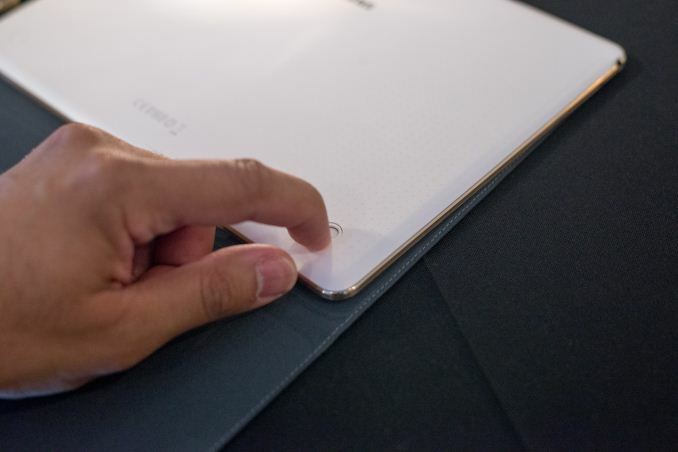 Like the GS5, the Tab S integrates a swipe fingerprint scanner into the device's home button. Samsung appears to either have improved the behavior of the fingerprint scanner in the Tab S or it’s just easier to use on a tablet laying flat compared to a handheld phone. I suspect the reality is a combination of both. I registered my left index finger on one of the Tab S devices and had no issues unlocking the device. With the GS5 I found that my swipes had to be deliberately paced, but on the Tab S I could swipe fast or slow or at an inconsistent rate and still trigger a successful unlock. I didn’t try using the fingerprint scanner on the Tab S with the tablet held in the air or propped up at an angle so there’s lot more to try when I get my hands on a review unit. 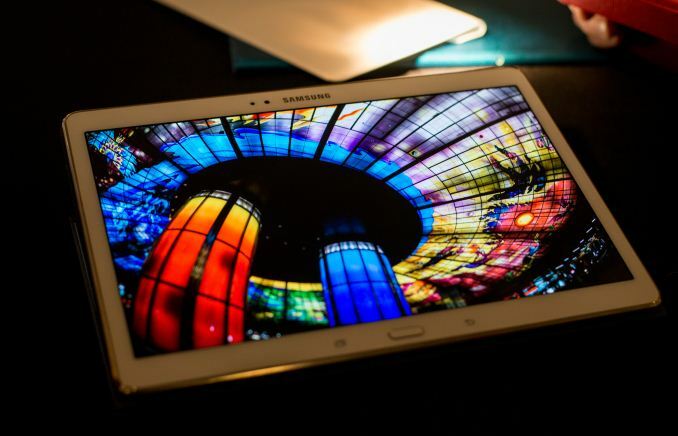 Internally the Galaxy Tab S features either a Samsung Exynos 5 Octa (5422?) SoC or a Qualcomm Snapdragon 800 (no word on why Samsung opted against using an 801). WiFi-only models will ship with the Exynos 5 Octa, while cellular variants in North America will ship with Qualcomm’s MSM8974v3 silicon (and integrated LTE modem). Global variants with cellular connectivity will support voice calls from the device itself, however US LTE models will not. All devices ship with 3GB of LPDDR3 and a minimum of 16GB of NAND on-board. Global variants will be offered with 32GB as an option. 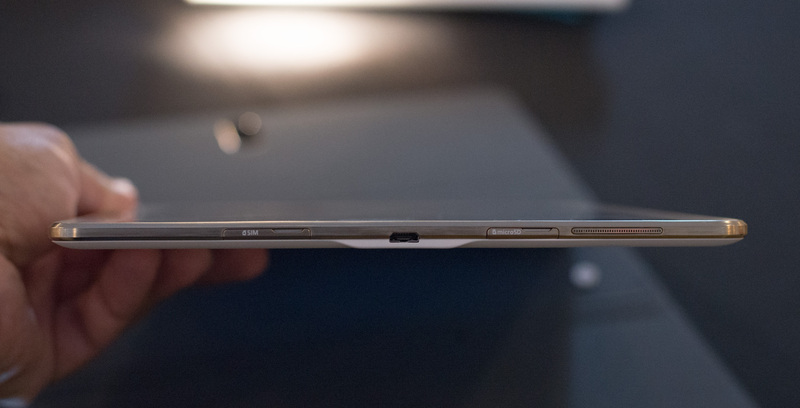 A microSD card slot is standard on all Galaxy Tab S devices. Like the Galaxy S5, the Galaxy Tab S supports 2-stream 802.11ac - likely using the same Broadcom controller. Samsung’s download booster function is also supported (on models that feature both WiFi and cellular connectivity). Unlike the GS5 however, there’s no USB 3.0 support on either Tab S. There’s a single micro USB 2.0 port on the right side of the device for charging/sync. Internally the 10.5” model has a 7900mAh battery, while the 8.4” model has a 4900mAh battery. Samsung didn’t disclose the voltage of either battery, assuming a standard 3.8V chemistry we’re looking at 30Wh and 18.6Wh, respectively. 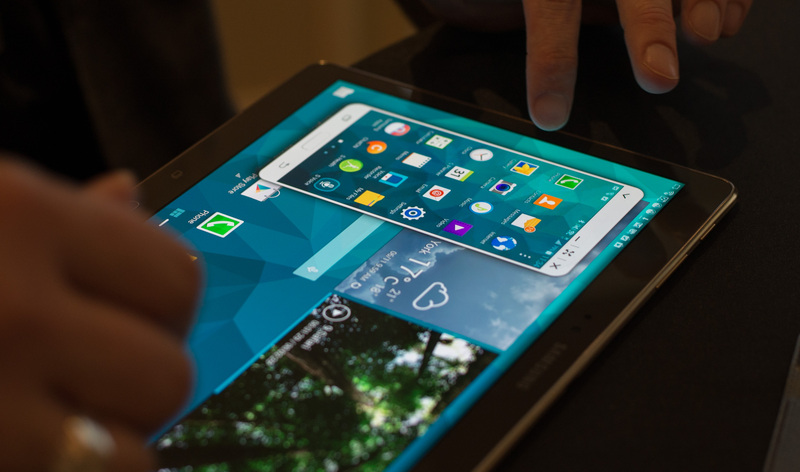 The Tab S line features the same updated TouchWiz UI that debuted on the Galaxy S5. That includes flatter iconography and widgets, reduction in the number of quick settings options and a simplified camera UI. In my brief hands on with the tablets I did notice some other improvements. The biggest? Bringing up the recent apps list has a much shorter lag associated with it on the Tab S compared to the Galaxy S5. I did notice some infrequent hiccups in UI frame rate in using the Tab S, which is to be expected given the extremely high display resolution vs. GPU power/bandwidth under the hood. The new Tab S features SideSync, which allows you to stream and interact with a paired Galaxy S5 over WiFi Direct. With SideSync running, you can access almost all of the features of a paired GS5 device (minus things like Camera) directly from the Tab S. You’re presented with a virtual GS5 on the Tab S’ display, which you can also take full screen. The UI and any content is streamed over WiFi between devices so there’s a bit of lag (and understandable sub-30fps UI frame rate). Samsung demonstrated running Candy Crush on a GS5 streamed to a Tab S over WiFi Direct. For applications that don’t demand instantaneous response, you can absolutely stream them remotely. With SideSync enabled and linked to a GS5 you can also answer phone calls on your Tab S (including the ability to switch between Tab S and GS5 in the middle of a call). Samsung has a handful of first party accessories launching alongside the Galaxy Tab S. Rather than relying on magnets to attach covers to the device, both Tab S models have two indents on the back that can accept a button mounted cover. Attaching a cover to the Tab S is a lot like buttoning pants or a shirt, line up the indents with the buttons on the cover and apply pressure to snap the two together. To remove the cover just hold the tablet and cover in opposite hands and pull the two apart. I have to admit it’s an odd sensation on a tablet, but it results in a sturdy connection and it works. I suspect Samsung was primarily motivated to reduce costs here though. 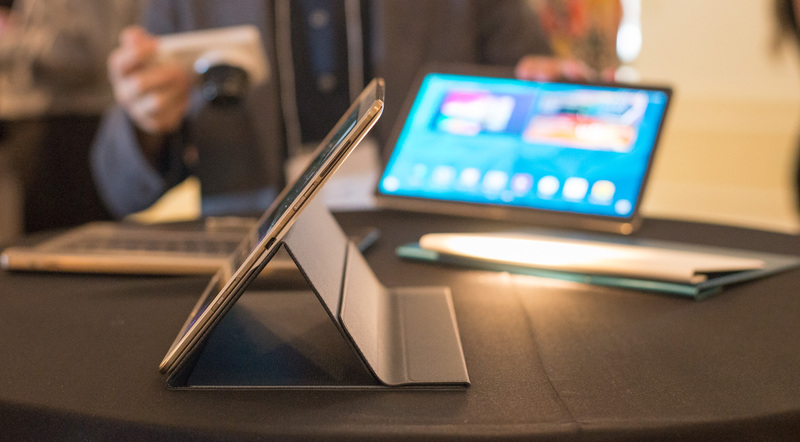 The Tab S cover can be folded into three different stand positions: typing mode, touch mode and view mode. The positioning flexibility comes at the expense of design complexity. There’s a steeper than expected learning curve to getting the hang of how to properly fold the cover to achieve the right operating mode. Samsung also offers a Bluetooth keyboard accessory with similar styling to the Tab S.
Beginning in July in the US the Galaxy Tab S 8.4 will be available at $399 (16GB/WiFi), while the 10.5” model will retail for $499 (16GB/WiFi). The LTE versions will come to AT&T, Sprint, T-Mobile and Verizon. AT&T, Sprint and T-Mobile will carry the 10.5" model while Verizon will launch with both the 8.4 and 10.5" models. Global variants will be available in select markets later this month. Very, very nice. A beautiful screen, an OS that can have more than one app on screen at a time, and accessories that are quite elegant, set this apart from much of the competition. If I were to buy a tablet, this is what I would likely get. Amoled displays seem to be suffering from quite a severe burn-in effects. However, it's quite difficult to actually find any discussions about this in reviews of the phones. Here is a simple picture from a local carrier store and it's quite obvious. The icons in the task bar are extremely static on any phone. I've never seen any of those icons leaving a mark on my phone.